The last of the grass eating primates–all others are now extinct–gelada baboons are found only in Ethiopia above 1800 meters. 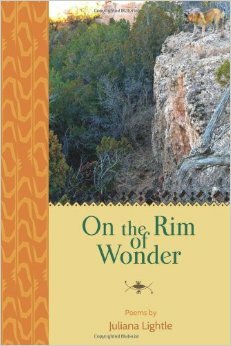 The first I saw ran up and down the cliffs at Menelik’s Window. 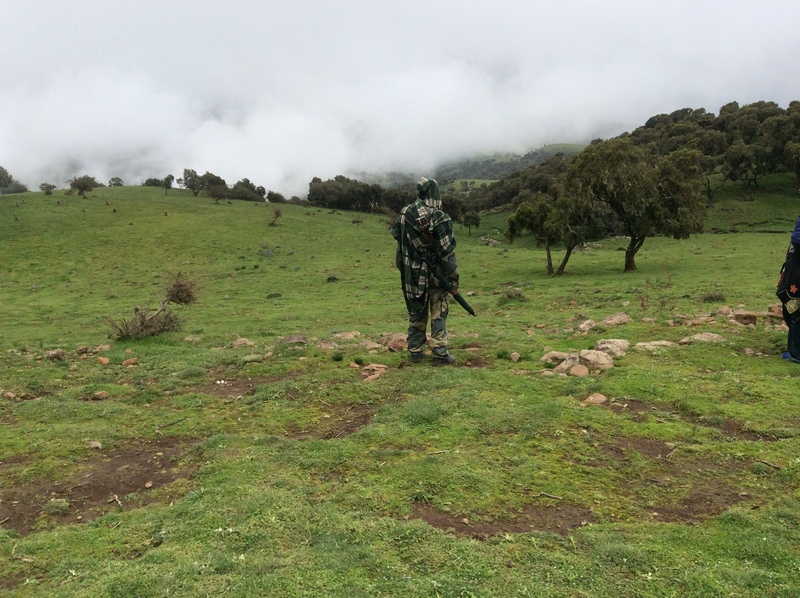 Because the people in this area use large tufts of grass to make house roofs, boys patrol the area, attempting to keep the baboons from eating this particular type of grass. Perhaps because of their experience being chased persistently by humans, these baboons were hard to photograph up close because they ran off. The boys who guard the grass pass time by making hats and other items out of the grass the baboons want. 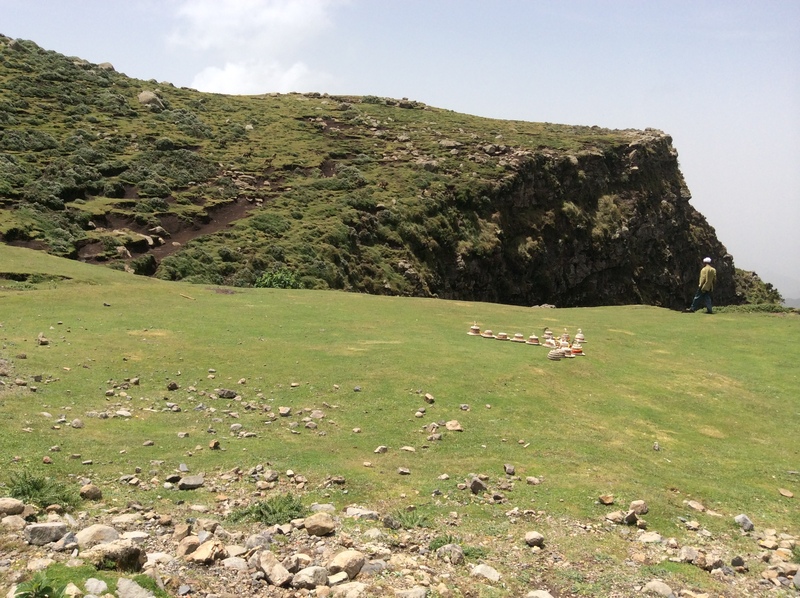 If you look closely at the following photo, you can see a couple of baboons running up the slope. 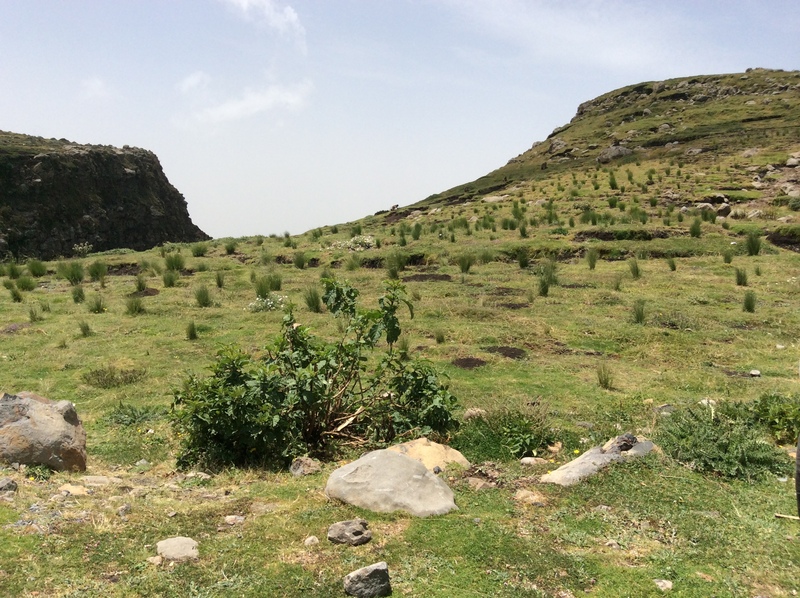 Although you can see gelada baboons in several places in the high mountains of central Ethiopia, their major sanctuary is Simien Mountains National Park. Here they are protected from hunting. 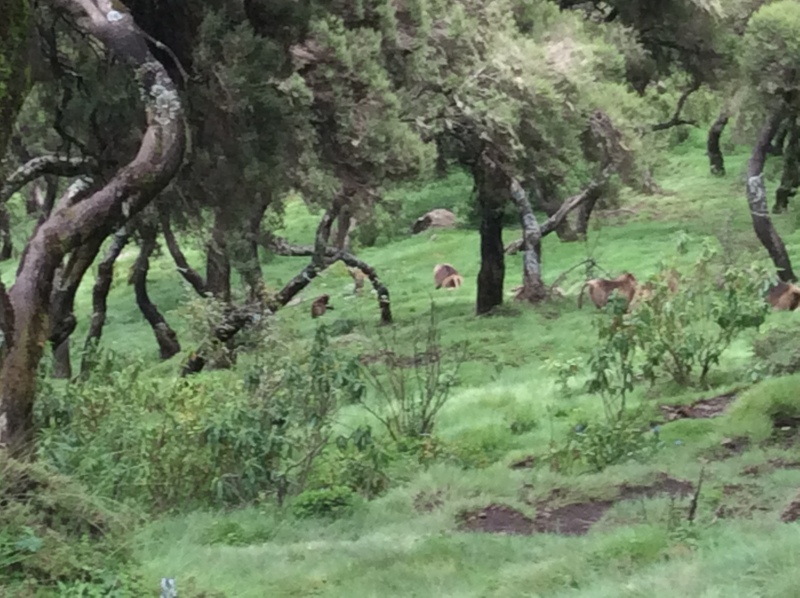 Unlike those at Menelik’s Window, these did not run off especially if one walked along quietly or stopped to watch. Unlike other species of baboons, these are not aggressive. The males may appear to be boss because of their big manes, red-hearted chests, and size, but such is not the case. 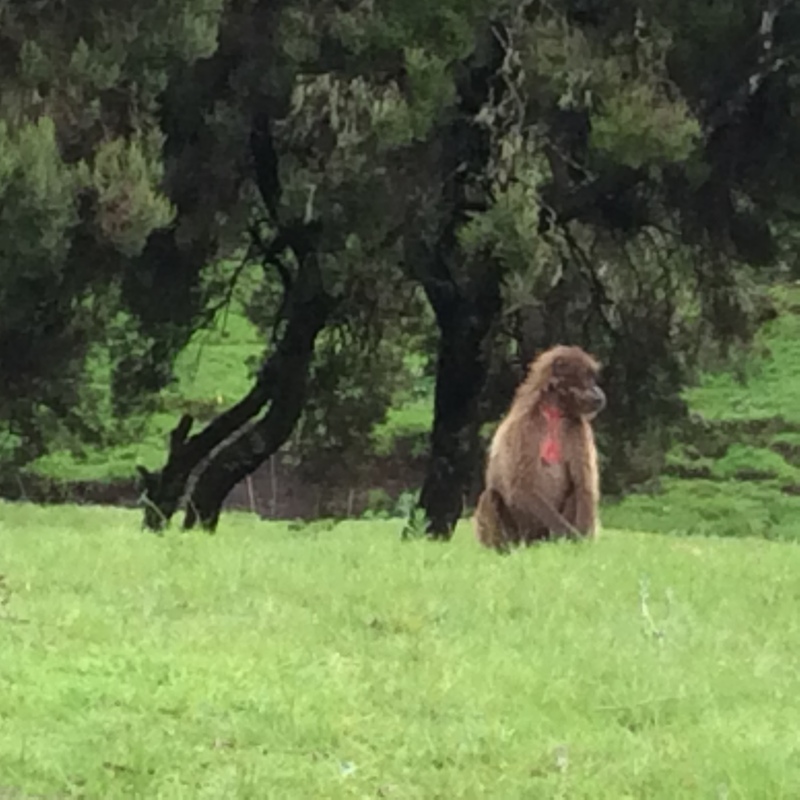 In the world of gelada baboons, females rule. Females even choose the one male that shares up to six or so females. The male may try to fight off contenders, but in the end the females choose. Because I found many of the 2000 feet cliff drop-offs a bit daunting, on the hike I chose to go higher with the guide. A fortuitous choice for sure. 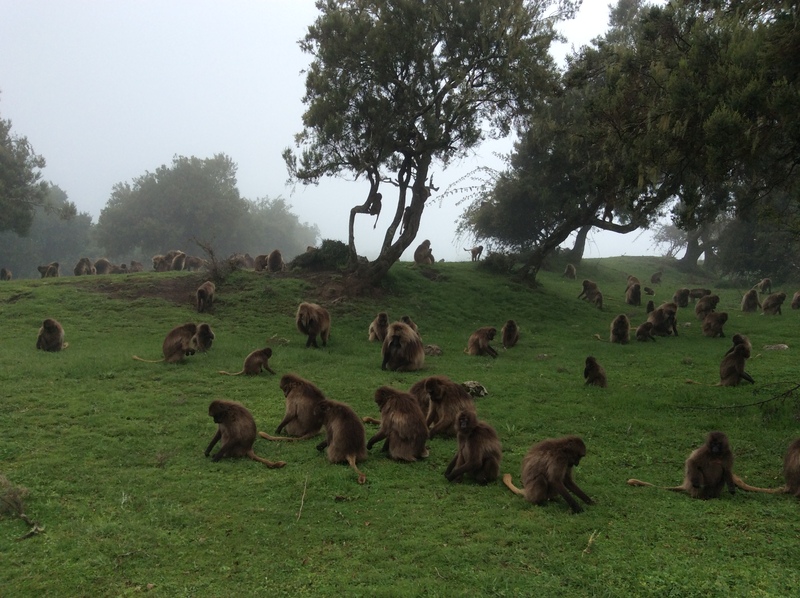 We found ourselves surrounded by a huge troop of peacefully grazing baboons complete with babies playing in the trees. 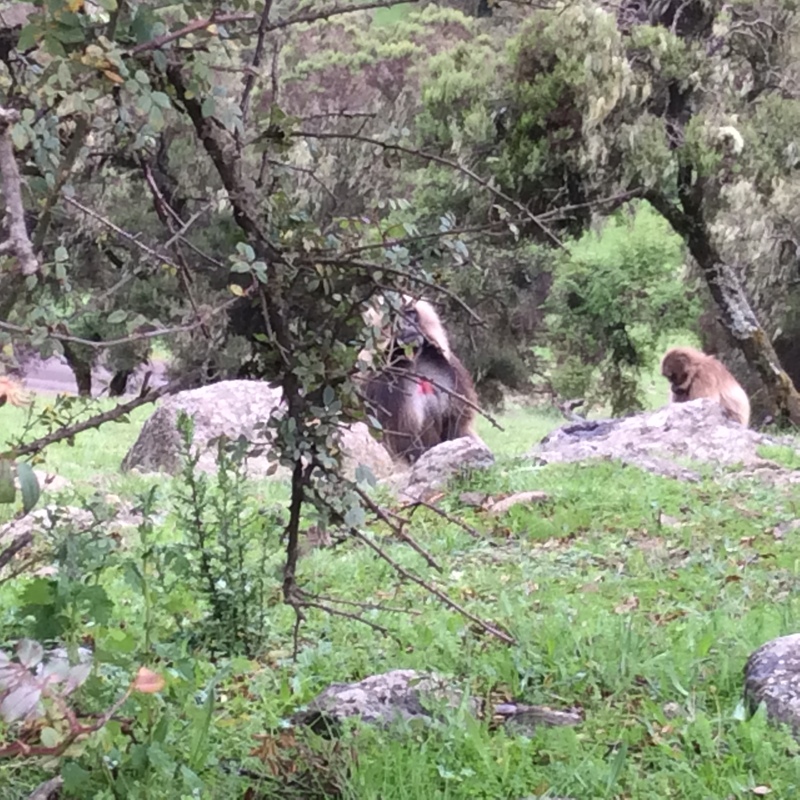 Gelada baboons spend their days sitting on their fat humanlike buttocks eating grass. Except for humans they are the most terrestrial of all the primates. They climb down the steep cliffs at night to sleep in tight groups. This helps them escape predators, e.g. leopards and hyenas. 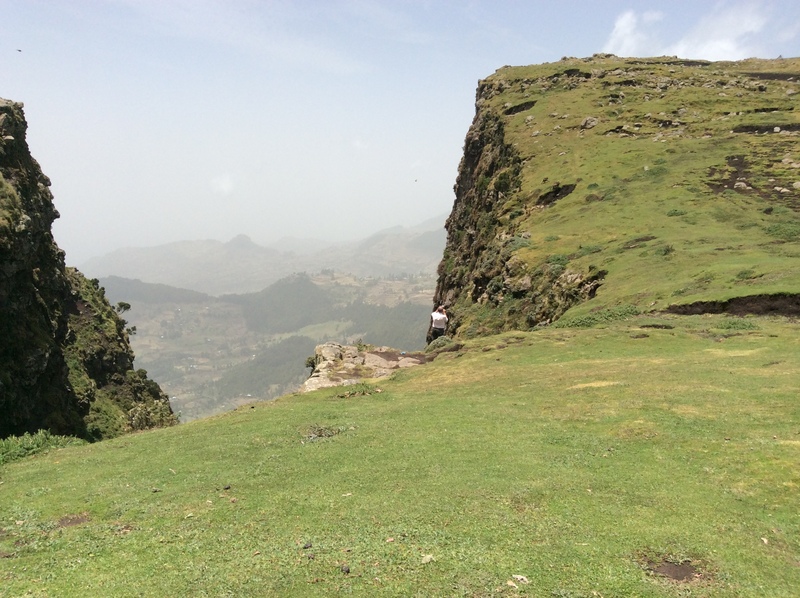 Probably their safest habitat is Simien Mountains National Park because to enter the park every visitor has to sign in. Everywhere you go, an assigned guard with an assault rifle accompanies you. Because of the rainy weather, he slung his assault rifle over one shoulder and held his umbrella in the opposite hand. 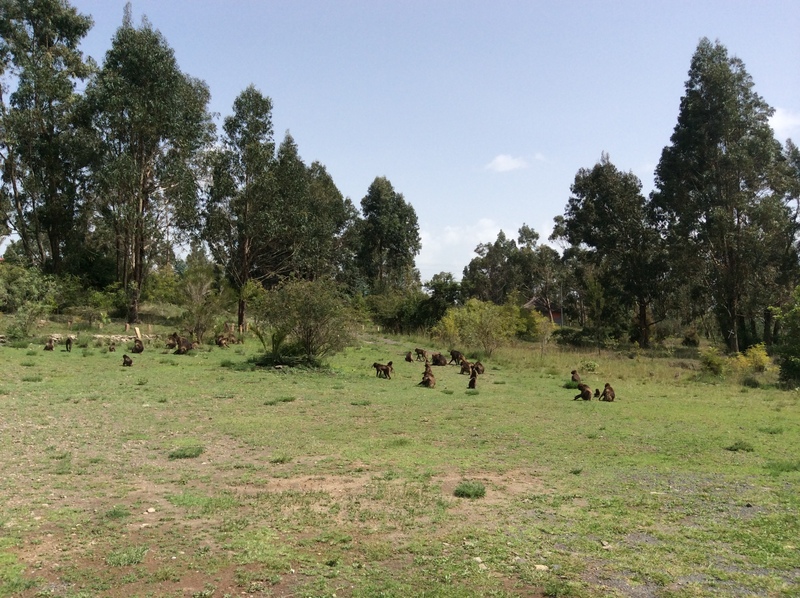 We did not see any more gelada baboons until several days later on the last day of our road trip when we stopped to visit a sort of inn/hotel owned by a German woman. Experts estimate only one to two hundred thousand remain. Habitat loss and hunting males for their manes threaten their survival. They are listed as a threatened species.